What Are Backup Iron Sights (BUIS)? A rifle’s iron sights are the basics. They are a shooter’s ‘bread and butter’, as it were. With so many advanced optical accessories available, it is best to be reminded of why iron sights are a necessity. And make no mistake – they are. That is why so many rifles and shotguns come with sights already fixed onto them. They are an integral part of the firearm. Seemingly, new kinds of optics are a lot more reliable (and much more precise) than the old-fashioned iron sights. However, even if you have the best scope, laser, or reflex sight in the world, you cannot count on them 100%. That is why it is always a good idea to have back-up sights, even if you have complete faith in your rifle’s glass or laser. Optical accessories can fail, run out of power, or sustain heavy damage due to terrain and shrapnel. So, we’ve established that iron sights are indeed necessary, but what exactly are they? Essentially, iron sights are a system which helps the shooter find a target. The markings or shapes on the front and rear sights are aligned with the target, and once that is done the shooter may fire away. If you are shooting within the rifle’s effective range, and if you have zeroed your sights properly, your bullets will hit the target. The rear sight is the one closer to the shooter’s eye. The front sight is the one closer to the barrel. On some modern rifles, both the rear and front sights are adjustable. There are firearms which feature a fixed front sight, and an adjustable rear sight only. Iron sights are commonly made of steel or aluminum, and sometimes polymer or similar synthetic materials. 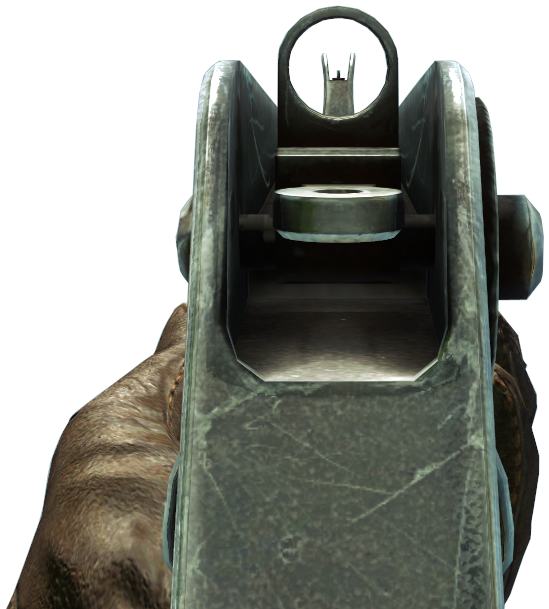 Some iron back-up sights are fixed, while others can be folded down and flipped back up when needed. Ultimately, it is the unique state of your weapon which will determine whether you need fixed or folding sights. Fixed sights have no moving parts, etc., so they are less prone to damage and malfunction. They have a clear advantage there over the folding sights. On the other hand, folding sights are more compact. They can stay on the rifle and provide a potential back-up, even if there is a red dot sight or scope sitting in their place. Should the need arise, the accessories can be taken off and substituted with the iron sights. If you plan on using iron sights as your main targeting method, they should probably be fixed. If you only need them as a back-up, folding sights should do the trick. The sights themselves come in two main configurations: gas block sights and same plain sights. With gas block sights, they sit a little higher up. This configuration features a front sight which sits on top of the gas block. This configuration is available only to rifles whose gas block is lower than the upper receiver. If the gas block is as high as the upper receiver, use same plain sights. True to their name, same plain sights are mounted on the same height as the upper receiver. 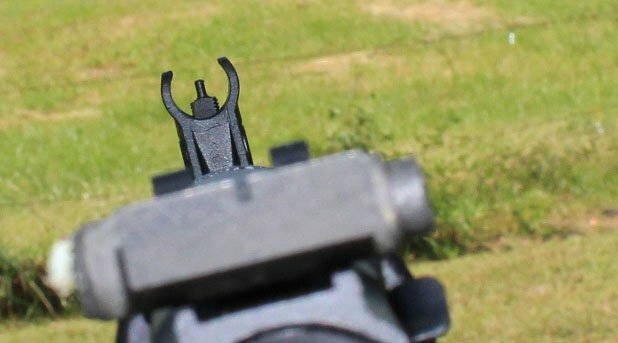 If the front and rear sights were to be put on a flat surface, the front sight’s post would be at the exact same level as the rear sight aperture. Iron sights may come in an open style or aperture style. Open sights are so named due to the top of the rear sight being open. The sight consists of some sort of notch, or alternatively a U or V shape, which is then aligned with the front sight’s ring or bead. Aperture sights, on the other hand, use a slightly different technique. These sights are also called “peep” sights or “ghost ring” sights, because the rear sight consists of a metal ring through which the shooter gazes. The rear sight then loses some focus, becoming a blurry shape. This is why it is called a “ghost ring”. The front sight is pretty identical to those which are part of the open sight configuration. Most civilian, law enforcement, or hunting rifles are built with open sights, leaving the majority of the aperture-sighted rifles to those designated as military assault rifles. Originally, sights were immovable. With time, advancements in firearm technology and firearm design have made it possible to adjust the sights (rear, front, or both – depending on the rifle). These adjustments can be made to factor in elements like windage and muzzle elevation. AR-15 / M16 – aperture sights. A circular hole for a rear sight, and an open dovetail with a post on the front. AK-47 / Variants – open sights. A notch for a rear sights, and an adjustable post as a front sight. Ruger 10/22 – open sights. The rear is a flip-up V notch kind of sight, and the front is beaded. As mentioned before, there are times when optical accessories literally take the place of a rifle’s original sights. 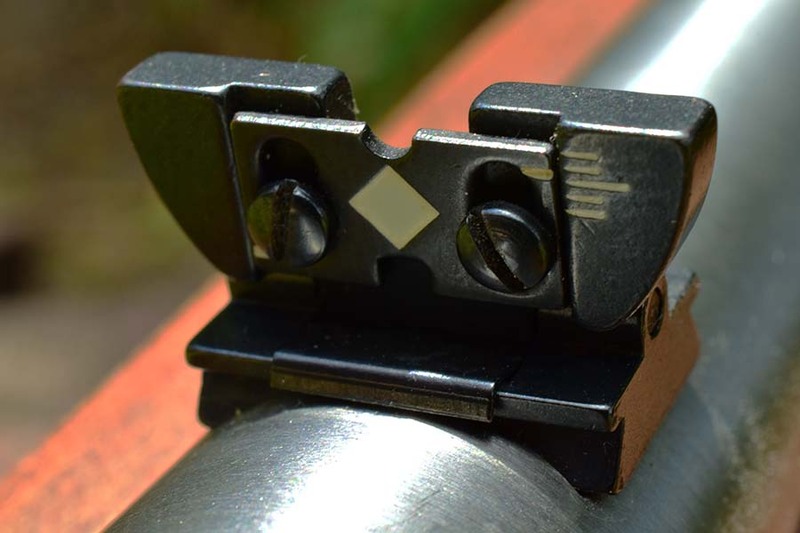 In order to still have the ability to use backup iron sights for rifles – without having to remove the optic accessories – there are companies which produce iron sights with a 45 degree offset. 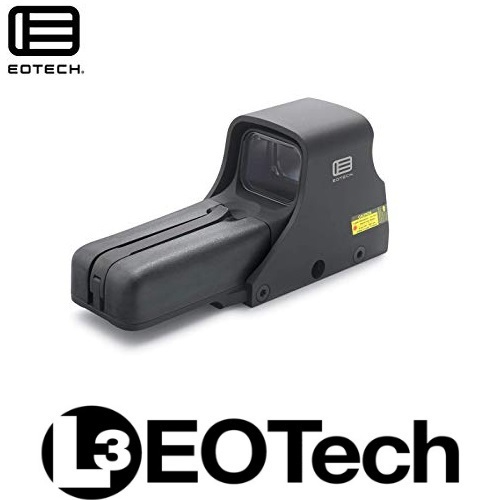 These are designed specifically for fast transitions between a scope or red dot sight, and iron sights. 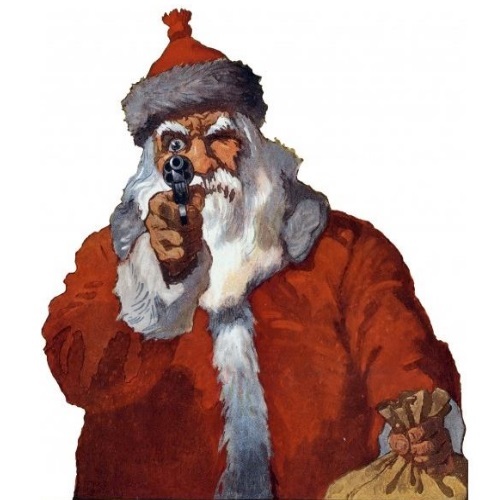 The shooter needs to only tilt his rifle 45 degrees – without removing his cheek from the stock – and the iron sights become usable. Longer-range target suddenly appears in your field of view? Simply tilt the rifle back to its original vertical position, find your target, aim, and fire. It may require some getting used to, but eventually you will be shifting from close range to mid/long range targets like a boss. NOTE: there are some great rifles, like the Kel Tec KSG, which arrive with no sights at all. While there are some great Kel Tec KSG accessories out there, ones which have absolutely nothing to do with sights, one of the first things a KSG owner should get is a pair of flip up iron sights. 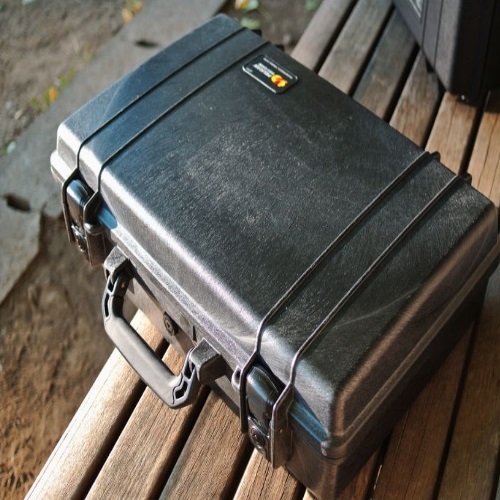 This is true whether they will be designated as back-ups, or as the primary targeting system. BUIS – Do You Need Back Up Iron Sights On a Rifle? The doctrines of war are an ever-changing thing, and with the advent of holographic sights, laser sights, and telescopic sights with amazing powers of accuracy and magnification – iron sights are quickly becoming a relic of the past. Nevertheless, they still serve a very important purpose. Even if you have a sight or scope mounted on your rifle, don’t ever neglect your iron sight training. These days, most engagements occur within the relatively short range of 50 yards or less. In reality, the chances of you needing your iron sights are a lot greater than the chances of you needing your scope which can pick off a rooftop threat 500 yards away.